In 1817 Jeremy Bentham, the utilitarian philosopher, argued that women should have the vote. It would be another 101 years before they got it. Increasing the number of male voters was controversial enough. In 1831, when the House of Lords rejected a reform bill, there were riots in British cities, buildings were set on fire, and the effigy of a bishop was burnt in a Huddersfield street, before the First Reform Act was passed the following year resulting in a very small increase to the male franchise. In the 1860s, John Stuart Mill, another utilitarian thinker and MP for Westminster, began to champion female enfranchisement, the lack of which he considered in his 1869 essay ‘The Subjection of Women’, a severe impediment to the progress of humanity. His plan was to change just one word in the legislation of the 1867 Second Reform Act, from ‘man’ to ‘person’, but he lost this vote by 194 to 73. The 1867 Act gave more men the vote as did that of 1884, but women were still excluded. By the end of the 19th century, women, some of whom had earned university degrees and entered various professions, and many of whom were fulfilling valuable roles in society, were still being treated like second-class citizens. To add insult to injury, they were expected to pay their taxes just like men. In 1903, frustrated by the lack of progress, Emmeline Pankhurst founded the militant Women’s Social and Political Union. After a few years of campaigning, little progress had been made, and the government under Liberal Prime Minister Herbert Asquith were dragging their feet. 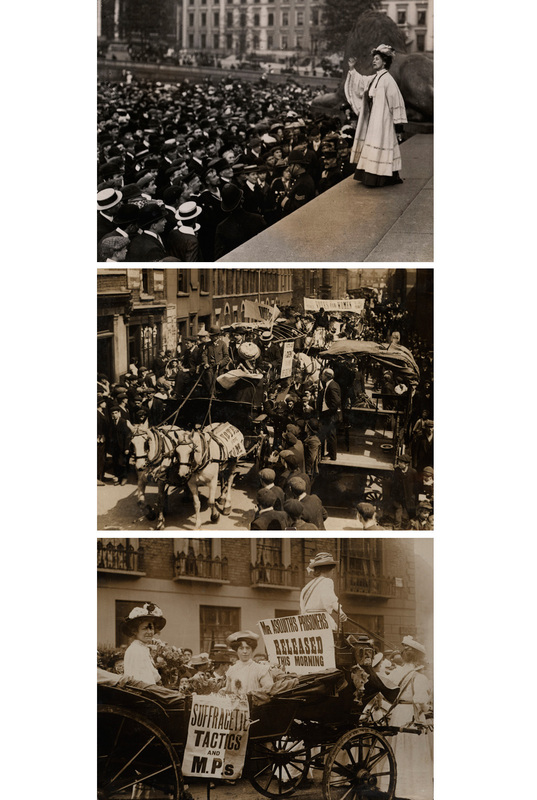 Women taking part in peaceful deputations to the Houses of Parliament were arrested, and matters quickly escalated, with members of the WSPU resorting to window-breaking, painting-slashing and other subversive activities. The 2nd April 1911 census night saw suffragettes all over the country sleeping rough to keep their names from being recorded. If the votes of women didn’t count, then they themselves shouldn’t be counted either, they reasoned. By 1914 things were at a stalemate, but the First World War became an unlikely ally in the fight for the female vote. Most women patriotically put their campaigning to one side and turned their energies towards the war effort, nursing the wounded, working in factories, on public transport, on the farms, and generally keeping the country going. 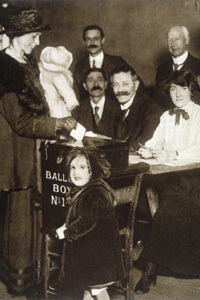 As if in reward for their wartime work, in early 1918 legislation giving women the vote at last went through, while the first woman MP to take her seat in Parliament, Nancy Astor, did so in 1919. Restrictions which gave the vote only to women over the age of 30 who were householders, married to a householder or holder of a university degree prevented all-out celebration, but this was remedied in 1928, when the qualifying age was brought down to 21. Political equality with men was at last achieved.